Cold weather can be tough for pets, and just like us, some times it can make their joints stiff and uncomfortable. When I was a vet assistant, I saw this a lot. Pet parents would be really concerned about their furbabies not being as playful and just stiff; especially the older dogs. Before prescription drugs were tried, a lot of the veterinarians I worked with would try a dietary supplement called Glucosamine. Glucosamine has been “known” to help with some joint problems. I can’t really go into details since I am not a doctor. I recently saw Glyco-Flex on EntirelyPets.com, and not only does it contain that Glucosamine that almost all of the vet’s recommend, it also contains Perna canaliculus and Dimethylglycine just in their base formula. So you are getting a triple dose of joint support in one dose of Glyco-Flex. There are some differances between the Glyco-Flex I, II, and III. Here is the best explination I found between them. With Glyco-Flex you do a “loading” dose for a week and then do “supportive” dosing for as long as your vet deems it safe. Glyco-Flex is not hard to give either. Each chew-able tablet comes in a dog friendly flavor, so your little four legged baby shouldn’t have any trouble taking it. All three of my dogs, Evie (doesn’t know she’s a dog, so no one tell her, she is also not pictured due to health issues), Bailie, and Tobie, are under 30 lbs, so they only have to take 1/2 a tablet. Bailie is 10 years old, so I am giving her the Glyco-Flex III. Tobie is 5, so he is getting the Glyco-Flex II. As always you should be totally informed with what’s in any product you give yourself, your children, and your pets. Talk to your vet! Read about your options. If you have any questions about Glyco-Flex, here is all of the technical information you might need. GlycOmega™ is a trademark of Aroma New Zealand Ltd.Tablet Inactive Ingredients: brewers yeast, cellulose, natural imitation roast chicken flavor, silicon dioxide, stearic acid. Chews Inactive Ingredients: brewers yeast, canola oil, chicken liver flavor, citric acid, glycerin, mixed tocopherols, propionic acid, proprietary blend (maltodextrin, sodium alginate and calcium sulfate), rosemary extract, silicon dioxide, soy lecithin, vegetable oil, whey. GlycOmega™ is a trademark of Aroma New Zealand Ltd.Tablet Inactive Ingredients: brewers yeast, natural imitation roast chicken flavor, silicon dioxide, stearic acid. GlycOmega™ is a trademark of Aroma New Zealand Ltd.Tablet Inactive Ingredients: brewers yeast, cellulose, dicalcium phosphate, natural imitation roast chicken flavor, silicon dioxide, stearic acid. GlycOmega™ is a trademark of Aroma New Zealand Ltd.Inactive Ingredients: brewers yeast, canola oil, chicken liver flavor, citric acid, glycerin, mixed tocopherols, propionic acid, proprietary blend (maltodextrin, sodium alginate and calcium sulfate), rosemary extract, silicon dioxide, soy lecithin, vegetable oil, whey. 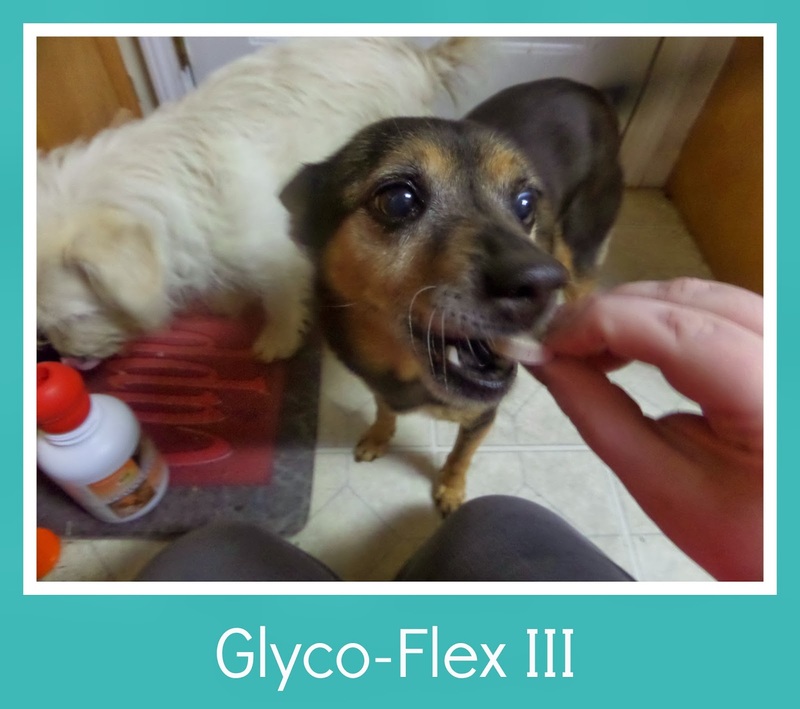 If you would like to try Glyco-Flex for your dog, there are a number of website and pet stores that sell it. I got mine from EntirelyPets.com, and I’ve been very pleased with it. We love gycoflex. We have given it to our pomeranian since he began having problems with his trachea, it has made a world of a difference for him and help him so much, we are so grateful for this product. We got Samantha from the pound about 6 months ago! She is super sweet and has alot of energy. She is a German Shepherd/Retriever mix! The Shepherd part is why I would like to start giving her something for her hips! My fur baby rotty needs this for her hips. My dog is a German Shepard/Rottweiler mix and his name is Bullet. He loves to play ball.